Fantastic pair of excellent vintage 1960s T-chairs in black leather with chrome frames. William Katavolos in collaboration with Douglas Kelley & Ross Littell designed the iconic leather sling T chair model 3LC in 1952 as part of Laverne's Sculptural New Furniture series. The T chair can be found in the Museum of Modern Art and many other museums worldwide. 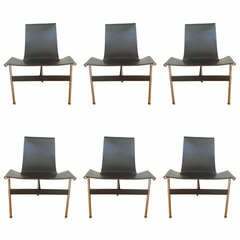 These chairs are in very good pre-owned condition and come from the original owner who cared for them. There is no damage. Chrome is nice and leather is supple. A set of six very elegant dining or occasional chairs in the original cranberry colored velour upholstery. Good usable original upholstery. 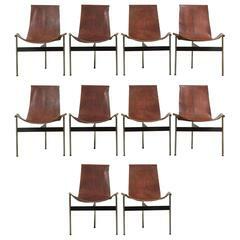 Set of four patinated leather T-Chairs by William Katavolos, Ross Littel and Douglas Kelley for Laverne Originals. Made in USA, circa 1952. T-chair designed by William Katavolos for Laverne, 1952. This example with original leather.